Eternity rings may be thought of as wedding bands encircled with diamonds. They are often given as gifts from husbands to their wives to mark a significant wedding anniversary. The diamonds surrounding the ring convey the symbolism of the eternal love shared by a couple. Diamond eternity rings are popular as they represent a coming of age of the relationship between a husband and wife. Whilst the wedding band signifies the beginning of a union, the eternity ring reaffirms the past vow and celebrates the future commitment. In a fusion of modern and traditional customs, nowadays, eternity rings may be used as wedding bands. 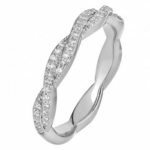 Either way, eternity rings are a stunning complement to diamond engagement rings and wedding bands. 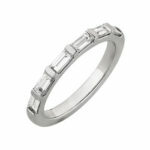 The classic beauty of eternity rings means they will be cherished for a lifetime. 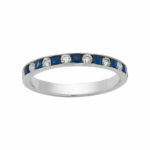 Eternity rings made with diamonds completely encircling the band are known as Full Eternity rings. 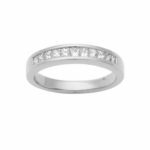 Full Eternity rings need to be custom made because they are difficult to resize due to the diamonds going all the way around the ring. Many people prefer this design because of the symbolism of endless love. 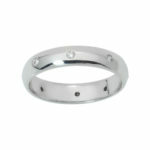 Half Eternity rings have diamonds across the top section of the band. The advantage of this design is that is easier to resize and a fewer quantity of diamonds means more can be spent on the quality. 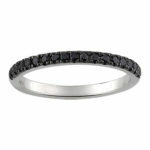 At Raffini Jewellers we can custom make your Eternity ring according to your preferences. 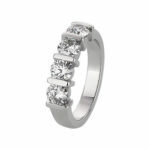 Eternity Rings may be made with your choice of metal, setting and diamonds to suit your budget. Whether a Full or Half Eternity Ring, we will discuss the various designs which will complement your engagement and /or wedding ring. During an appointment you will be able to try on some different designs to help you decide which feels more comfortable.